History - Today's news is tomorrow's history! Parents expecting a baby (or babies) don't have a corner on debating which name will be a perfect fit for the newcomer. Writers, likewise, chose carefully. Names bear more thought an consideration than many writers realize. Exploring names and their meanings for your characters can be fascinating, as well as very enlightening. BabyNamer.com, http://www.babynamer.com/ is fast, efficient and very useful for finding names, their origins and definitions, nicknames, etc.. Click a letter of the alphabet at the top to generate girl\boy lists alphabetically. Click color button, pink or blue to get names by gender. Click name. The right side panel gives clickable options that return information about Name Page, Name Sakes, Similar and Drawbacks, each requiring only a mouse click to bring information lightening fast! Behind The Name, the etymology and history of first names, http://www.behindthename.com/, is a terrific resource that lets you check popularity, related names, name day, name ratings, etc., arranged by nationality, mythology, biblical, and many more options. You'll like the Alphabetical Navigator in a box at the left. Kabalarian's site is an invaluable and fascinating site that concerns names, Kabalarians Philosophy, http://www.kabalarians.com/ Although time ran out before I was able to download the alphabetical name list, by using the Search box near top right of page, typing in a name, and then checking What Does My Name Mean?, I gleaned some information. Kalabarian Philosophy Electronic Newsletter, The Newsline, contains a vast amount of information about names. Find the top 100 names in any given year at Social Security Online, http://www.ssa.gov/OACT/babynames/. You can also search a name to discover the year(s) it was most popular. After you've studied at these sites, you'll be much better equipped when naming your characters, and you'll probably visit repeatedly. Google, who acquired the rights to all out-of-print books in a class action settlement a while back, has now entered the e-book publishing marketplace, Google e-bookstore, http://books.google.com/ebooks. Scroll about halfway down the home page to locate free books. Seven pages of e-book titles provide a wide selection of the classics you may have read in print years ago. Since my books, Behind These Mountains, vol. 1, 2 and 3 are out-of-print Google also was awarded the right to digitize them and make them available to the public. Just as they were awarded the right to publish thousands of other out-of-print books in spite of the author's objections. When I first heard about the class action lawsuit I took the opportunity to *opt in* not knowing how it would affect me. And I'm still unclear about many of the settlement's effects. I don't know whether the details of the settlement also gave them permission to e-publish the books and offer them free to the public as they have with the classics advertised on their website now. I've contacted mailto:BookSettlement_en@rustconsulting.com in an attempt to find out. The good news is, the e-books Google publishes can be read on just about any electronic device you own, http://books.google.com/help/ebooks/overview.html. Since my books are regional history books about the sparsely populated area of the Cabinet Mountains where the Clark Fork River flows in northwestern Montana I'd be surprised if Google ever does digitize and make them available. I'll post whatever information I locate so that other authors of out-of-print books can know what they might expect. To get the latest excellent information don't miss David Conroy's November 9th article How to self publish an e-book at cnet reviews, http://reviews.cnet.com/how-to-self-publish-an-e-book. Conroy explains not only the nuts and bolts, but also gives price and profit comparisons for the most popular, well-known e-publishing venues. If I were forced to choose a one-word description for Rockford: A History, impressive is an apt overview for this recently released regional history about the Palouse in southeast Washington State. Compiled by Ardis Dashiell, who has lived in the Palouse for sixty-five years, took upon herself the daunting task of preserving its past. 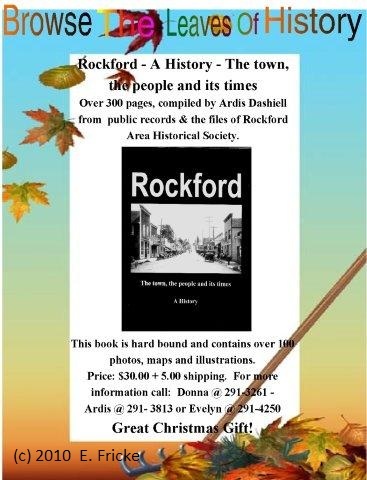 The Rockford Historical Society funded publication of the 344-page hardback book. It includes interviews, her personal knowledge and previously published works. 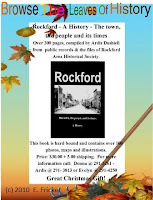 Two thirds of the original print run of 300 copies sold out within days, demonstrating that Rockford: A History has an audience. "I'm a quilter, genealogist, and now a historian I guess. Being a longtime resident of the area helped tremendously." Her ability to piece together a masterpiece isn't limited to fabric. Stories and documentation in Rockford: A History clearly paint colorful pictures of homesteading and development in the area comprised of rolling plains cleft by deep basalt canyons and surrounded by low mountain ranges. Like many regional histories, Ardis' well-done book is a labor of love. Uncounted hours of devotion transpired before this valuable record of bygone days made it to a printer and bookbinder. "I learned more than I anticipated," she says of the research and tasks involved in writing a local history book. "It took me twenty years." Profiles of the town's founding fathers (*) businesses, schools, churches and families create the saga of a growing community. Like scores of other early towns, hardy settlers battled and conquered the challenges of devastating fires and floods. Photographs from numerous private collections, maps, land plats complete with names, add depth and meaning to the settlers part in American history. Creation of the Coeur d'Alene Indian Reservation is among the many biographical sketches contained in the book. The photograph on page 127 is meaningful beyond words. It captured the mien of thirteen tribal members just after "they had been to Coey's Bank to receive the first major payment of one half million dollars which was paid to individual Indians..." Twelve of the recipients of the distribution of Federal money are named. Almost inevitably, the photographs, which include images in local historical society files, do not identify the photographer. Also omitted are addresses for early-day schools, churches, and of far too many businesses that no longer exist. Nevertheless, the old images convey a priceless intimacy to Rockford: A History, and include a wealth of remarkable insights into the past. Gaining a wider audience for the hefty volume will take time. But sooner or later some readers will tweet or post on Facebook or another social network about Dashielle's book. Then, like the windstorms that frequent the Palouse and waft its topsoil to distant regions, word of this impressive saga of the olden days will spread. One caveat, however, is that the publication lacks a ISBN, which means this valuable book will be available in only a few libraries. Sadly, the ongoing research, planning, and marketing it takes to sell a book in today's world is expensive and time-consuming, even when the book is worthwhile. But as publishers of regional histories attest: each new generation searches for its past, thus regional history keeps on selling and selling and selling. This is Dashiell's third book. Her first, a tribute to her mother was limited to copies only for her immediate family. Her earlier major book is a large hardbound history of Mount Hope, Washington. Once a thriving nearby town of over 800 souls, time and circumstances have reduced it to a wee hamlet comprised of a few buildings. "I imagine a second edition will be ordered before long." Send $30 + $5 shipping and handling to Rockford Historical Society, P.O. Box 107 Rockford, WA 99030 to order what is certain to become a rare collector edition. Read the latest about this author and her award-winning husband, Tom, http://www.hereford.org/node/6953. Ann Hite's novel, Ghost On Black Mountain, won't be available until the fall of 2011, published by Gallery Books (imprint of Simon & Schuster), but the book's cover went live on her site today. See it here, http://www.annhite.com/32505.html.) Meanwhile, continue to enjoy the stories Ann has posted on her web wite, http://www.annhite.com/. This post diverges from writing, but the importance is high priority, so please read and help if you can. Eva, an eighteen month old baby, needs surgery. Born May 4, 2009, in Minsk, Belarus, Eva has liver cirrhosis and is suspected to suffer from Alagille Syndrome, a genetic disorder that affects the liver, heart, kidney, and other functions. She needs a liver transplant as early as possible and her mother will be a liver donor. Her parents need help raising the money required to give Eva a chance to live. If you have doubts that this may be a spam, there are links to relevant information about Eva on the website: her medical reports; a full list of every dollar received for Eva until now, the website of the hospital where her surgery will be performed, and coverage of Eva on Belarus TV. Also, please consider visiting the Help Save Baby Eva Facebook Page: http://www.facebook.com/home.php?#!/pages/Help-Save-Baby-Eva/164910873531500 and clicking on the Like button. This request came to me via Niranjana Iyer, http://niranjana.wordpress.com/. Email: Niranjana (dot) Iyer (at) gmail (dot) com. Thanks for helping to give Eva a chance. At 05:29 AM 11/9/2010 owner, Jeannette Angell Cezanne wrote, "Thank you very much! I appreciate you visiting with me! Because of this opportunity I discovered that a great many writers today use their web site primarily to promote the sale of their books and offer services for a fee. They also offer "freebies" to attract visitors to their web site. A "guest blog" is a free gift to visitors. Newsletters are also marvelous freebies. Both are excellent ways to provide valuable insights into the business of writing. The guest blog is written pro bono, and it helps promote not only the guest's website, but also web sites the guest mentions. Thus, guest blogs become marvelous, free advertising venues that spread exponentially, because more web site owners also have blogs and use social networks such as Facebook, Linkedin, Twitter, etc. Watch for my guest blog to be linked ~~ and do let me know where you find it!! My ego loves to be stroked! Watching my tracking stats increase weekly is heart warming, because then I know more writers ARE finding excellent, free training as I intended. Advice From the Pros, talks about plussing your novel here, http://tinyurl.com/35m6k9j. When I first saw the word "plussing" in regard to writing I hadn't a clue to its meaning. I quickly typed "plussing" into http://www.dogpile.com/, my favorite search engine. Voila, I discovered a lot, but none of it seemed relevant to writing. Scene setting ~~ which is often woefully inadequate or entirely missing from the manuscript. Staging, or moving the story forward ~~ but omitting descriptions of the physical movements called for, or using unclear or impossible actions. Because writers are "seeing" both their words on the manuscript page as well as a visual picture of the story in their minds, authors especially have trouble writing those two areas well. Both require plussing the manuscript. "Very impressive, but what's really impressive is the work you have done on Ghost On Black Mountain. I honestly have been savoring it. I'm three quarters of the way through and I have to say you nailed the Josie and Shelly sections. I'm so over the moon with the work you've done. I'll finish this week and we should chat ... honestly, I also don't want the last page to come so I've been reading the book in pieces as a present to myself after a long day. What a wonderful sign, right?! "More to come, but I didn't want to keep you in suspense any longer. Your additions really made this story bigger and better. Excited to read more tonight when I finally get home!" When Ann recovered from the thrill, she knew her editor had increased her awareness of how important it is that as you write, avoid the need to fill in missing details by not omit them in the first place. Insights from alumni wanted -- If you've taken one of Writers' Village University's free creative writing courses, please contact me privately. I'd like some insights. (mtscribbler@air-pipe.com.) R. J. "Bob" Hembree's Writers' Village University, http://writersvillage.com/, has a link to WVU's F2K Social, which includes free creative writing courses, run since 1995 at http://writersvillage.com/free/. It's staffed and Mentored by volunteers from Writers' Village University members. The next 7-week creative writing course begins January 5, 2011. Kindle Singles Will Bring Novellas, Chapbooks and Pamphlets to E-Readers is the caption on Tim Carmody's Oct. 12, 2010 article on Wired.com, http://tinyurl.com/33jr8dw. According to the article, authors will benefit because Amazon awards authors 70% royalty on singles books costing between $2.99 and $9.99. Check out the related links, also. With e-Books, or electronic publishing, you have the potential of reaching the largest possible audience. And you can publish in more than one format. Some people like to print out e-books; PDF would obviously work best for them. It's especially great when traveling. The Microsoft Reader software is available for Windows or Windows Mobile at http://www.microsoft.com/reader/ and it also has a text-to-speech package so the books can be easily accessed by the blind. You can create LIT files with the ReaderWorks software at http://tinyurl.com/343ayaa. Advantages are that e-books apparently go on forever. They can remain available and continue to sell, sometimes once a month, sometimes zero for several months, and occasionally as many as 50 a month. Author's get royalties (often not much but some) and someone is reading their work. However, while you're mulling your options, read Liz Castro's: EPUB Straight to the Point, http://tinyurl.com/2br2b2f posted at The Book Designer, http://www.thebookdesigner.com/. e-Books are reviewed by ForeWord Reviews, http://www.forewordreviews.com/. Contact Jennifer Szunko, Director of Clarion Review Services, jennifer@forewordreviews.com. They offer book reviews anytime, anywhere and anyone can Download their new iPhone App, http://tinyurl.com/3y9gqrn. Try first to get an agent to handle your work. Then try to sell it directly to a publisher. After both of those efforts fail, choose (carefully) an e-book publisher. However, every few months new developments must be considered. News reports abound that Amazon.com plans to stop offering e-books in Microsoft Reader or Adobe e-formats and will offer e-books only in Kindle or Mobipocket formats. Amazon owns the Kindle and Mobipocket. A major problem with electronic publishing has surfaced recently -- it can be tied to a format which can only be read by proprietary hardware or software. Only one of the formats mentioned --- Adobe --- is an open format which can be read without buying special hardware or software, and that is not one which Amazon is going to offer. It is imperative to keep abreast of the rapid changes taking place in the marketplace. In July 2010, Newsweek published this article by Isia Jasiewicz, http://tinyurl.com/2e4mgrl. It's difficult to keep abreast of the rapid changes in the publishing industry, but it's imperative for every writer who wants to succeed. Read more in Chapter 18 - Book Publishing: http://tinyurl.com/38d98qf. Read Lev Raphael's account in The Huffington Post about Scribd, which evidently advertises itself as a social publishing web site. On August 24, 2010, Raphael, noted author and reviewer, posted his article, An Internet Pirate Stole My Memoir, in which he fingered the pirate as a Scribd user. Writers guidelines are essential for marketing your writing so my blog will periodically focus on good databases of marketing guidelines, beginning with BellaOnline, The Voice of Women, http://www.bellaonline.com/articles/art1489.asp. Like many of the best database hosts, BellaOnline provides an awesome array of writers resources in addition to the 111 links that guide you to writers guidelines databases. Authors wishing to create an e-Pub will find a wealth of helpful options and information at Lexcycle.com Revolution in Reading, http://www.lexcycle.com/faq/how_to_create_epub. Provides ways to create e-Pub content. Includes a dozen links to options, a tutorial link, http://jedisabre.com/eBooks/tutorial/.asp, plus other related information, comments and FAQ resources. It's a good learning resource. Important news for aspiring authers, written by Sarah Weinman and posted 4/16/2010 at DailyFinance.com, regarding the impact of the iPad on writers says, "... 250,000 e-book downloads in the iPad's first 24 hours is serious business." Weinman's informative article on the subject is a must read for aspiring authors, http://tinyurl.com/yyv94op. The Rockford Historical Society launched it's website at rockfordhistoricalsociety.org. The homepage title, ROCKFORD PIONEER AND HISTORICAL MUSEUM, acurately describes the society's purpose of providing the region's past history, current events, and today's news -- which is tomorrow's history. Use the quick link in my favorites to visit regularly. Use the handy link at rockfordhistoricalsociety.org to send a congratulatory e-mail.